Citation: Zhang L, Reddy N (2018) Bioactive Molecules from Medicinal Herbs for Life Threating Diseases J Mol Sci. 2:4. Several chronic diseases affect humanity due to modern lifestyle. These diseases have the debilitating effect of considerably limiting a person's life span. Such diseases include cancer, cardiovascular, diabetes. The increasing trend of life-threatening chronic diseases has a major impact on the health care system in the word. The current therapies for treatment of life-threatening diseases such as anticancer drugs (e.g. doxorubicin, etoposide, camptothecin, 5-fluorouracil and cyclophosphamide), oral anti-diabetic drugs (e.g. sulfonylureas, biguanides, α- glucosidase inhibitors), and other anti-cardiovascular drugs, are used as monotherapy or in combination. However, these agents have many undesirable side effects. Therefore, identification of safer and more effective therapeutics for life-threatening diseases is the hot topic in modern drug discovery. Natural products from herbal plants play an important role in the prevention and cure of these diseases. This review covers compounds from herbal plants that were traditionally used for the treatment of life-threatening diseases. Furthermore, the structural elements responsible for their activities and the mechanisms of action of these natural products (such as flavonoids, peptides, polysaccharides) are also discussed. Finally, the status of the real utility of natural product based alternative therapies is highlighted and the future challenges to maximise their use are pointed out. Lifestyle diseases are of growing concern particularly in developed countries . Many prevalent diseases including type-2 diabetes, cardiovascular diseases, obesity and cancer lead to reduced life span [2,3]. Plant based natural compounds have long history of providing preventative therapeutic benefits against these diseases [2,3]. Diabetes mellitus (DM) is a metabolic disorder characterized by glucose intolerance and changes in lipid and protein metabolism [2,3]. According to World Health Organization projections, around 300 million or more people will be affected by diabetes by the year 2025 [2,3]. The current therapies for type-2 diabetes include mainly oral anti-diabetic drugs, such as sulfonylureas, biguanides, α-glucosidase inhibitors, thiazolidinediones, and dipeptidyl peptidase-4 (DPP-4) inhibitors, which are used as monotherapy or in combination. However, these oral agents have many undesirable side effects and ultimately cannot control the glycemic level. For example, sulfonylureas can cause weight gain and increase food intake . Therefore, the researchers are in constant search for improved anti-diabetic drugs. Herbal medicine has played an important role in treating diabetes in Asian countries [2-4]. Cardiovascular diseases (CVD) may develop due to complications arising from long-term diabetes, high blood pressure and high cholesterol. These are leading causes of morbidity and mortality in developed as well as in developing countries, and their prevention is a major public health challenge . In 2012, CVDs were the leading causes of deaths amongst non-communicable diseases (NCDs) and were responsible for more than 17.5 million deaths in the world . Over the past few decades, substantial advances in knowledge have occurred regarding specific health risk factors in vascular dysfunction . For example, several therapeutics have been developed to tackle hypertension. These include the use of angiotensin-I converting enzyme (ACE) inhibitors, diuretics, calcium channel blockers, and beta-blockers . Similarly, several agents were developed to treat high cholesterol. These include statins niacin, ezetimibe, and other drugs [8-11]. Although, these medications have played great therapeutic roles, most of them exert a wide range of side-effects, such as flushing, fatigue, headache, shortness of breath and dizziness are resulted by some anti-hypertensives drugs [10,11]. Also, the use of hypolipidemic agents can lead to hepatic diseases and rhabdomyolysis . Therefore, research to develop more effective drugs with minimal side effects continues. Cancer is one of the leading causes of death in the modern world . The occurrence of cancer is increasing because of the growth and aging of the population, as well as an increasing prevalence of established lifestyle related risk factors. such as lifestyle factors. Based on GLOBOCAN estimates, about 14.1 million new cancer cases and 8.2 million deaths occurred in 2012 worldwide . Numerous scientific investigations demonstrated that chemo-therapuitic agents such as doxorubicin, etoposide, camptothecin, 5-fluorouracil (5-FU) and cyclophosphamide are cytotoxic against human cancer cells [15-17]. However, it should be noted that these agents can also lead to severe side effects such as bone marrow depression, nausea, vomiting, headaches, hair loss . The side effects ultimately become so prominent that the patient cannot tolerate the treatment . Traditional medicinal plants have been used for the treatment of different types of cancers for thousands of years in Asian countries . Many bioactive compounds isolated from these medicinal herbs are currently in clinical use as anticancer agents. For example, Polysaccharide Krestin (PSK) and Polysaccharopeptide (PSP) derived from Coriolus versicolor are important anticancer agents due to their excellent anti-tumor activities and immune enhancing ability with minimal side effects [19-22]. Therefore, traditional medicinal plants are important sources of effective therapeutics that are likely to be cost effective with high activity. As can be seen later in this review there is an abundance of scientific knowledge on the functionality of natural compounds that have huge potential to develop therapeutics for life threatening diseases. Suitable translational research to transform this knowledge into practice is the future challenge facing the researchers in this field. Many traditional plant based medicines play an important role in health care. Phytochemicals are natural bioactive compounds found in vegetables, fruits, medicinal plants and aromatic plants that are beneficial to treat diseases. The phytochemicals from natural products cover a diverse range of chemical entities such as polyphenols, protein or peptides, polysaccharides, saponins and vitamins. In this section, several classes of chemical compounds from natural products that are used for the treatment of lifestyle diseases are described. Numerous scientific reports have identified the therapeutic compounds that are responsible for anti-diabetic action [3,23-25]. The main classes of antidiabetic drugs derived from plants are polyphenols, terpenoids, tannins and steroids [3,25,26]. These important compounds isolated from natural sources are described in this section. Polyphenols are a large group of bioactive compounds that possess various activities such as antioxidant, anti-inflammatory, anticancer, anti-diabetic and anti-microbial properties [3,25,26]. Flavonoids are the important class of polyphenols isolated from natural plants that are beneficial to manage diabetics and associated complications [3,25]. For example, davidigenin, 6-demethoxycapillarisin and 2’,4’- demethoxycapillarisin display significant anti-diabetic activities by inhibition of aldose reductase (ALR2) and phosphorene pyruvate carboxykinase (PERCK) enzymes [3,25]. Terpenoids such as coagulin C, 17β-hydroxywithanolide K, withanolide F, and coagulin L isolated from water extract of Withania coagulans Dunal have significantly inhibited post-diet glucose rise, lowered fasting blood glucose profile and improved the glucose tolerance . In addition, animal study indicated that sesquiterpene glycoside isolated from dried leaves of loquat possess significant hypoglycaemic effect [25-27]. Literature review demonstrated that the main factors leading to the formation of cancer include genetic, environmental and oxidative stress . Free radicals produced in human body during metabolic processes can trigger oxidative stress which in turn can activate inflammatory process . Prolinged oxidative stress and chronic inflammation can potentially damage biological molecules (DNA, protein and lipids) in living cells . Structural destruction of these functional macromolecules can ultimately lead to the formation of cancer [28,29]. Remediation of pro-inflammatory oxidants is therefore very important preventative measure in order to control cancer formation. Literature reveals that inflammatory cells produce certain chemokines such as CXC chemokine receptor 4 (CXCR4) and epidermal growth factor receptor molecules such as Human Epidermal growth factor Receptor (HER) . These chemokines play a complex role in cancer formation and growth. These important classes of biomolecules influence in controlling cancer formation and treatment . Various bioactive compounds have been isolated from TCM herbs and some of them are clinically used as anticancer agents . Flavonoids are important class of anticancer therapeutic agents in clinical use/clinical trial [30-32]. For instance, flavone and flavopiridol isolated from Dysoxylum binectariferum Hook can prevent cancer formation by inhibition of several protein kinases such as Cyclin-dependent kinases and tyrosine kinases [28,31]. In addition, plant flavonoids such as quercetin, genistein, daidzein prevent cancer formation by their antioxidant and immunomodulatory activities [31,33-35]. However, literature indicates that flavonoids exhibit significant multidrug resistance (MDR) modulatory activity, that causes a major problem for their use in chemotherapy . In recent decades, botanical polysaccharides have attracted a great deal of attention in biomedical research due to their significant immunomodulatory and anti-proliferation capacities [13,20,21,36,37]. Several bioactive polysaccharides isolated from mushrooms have been clinically used as anticancer agents and these polysaccharides include: lentinan derived from Lentinula edodes [21,38,39]. Polysaccharide Krestin (PSK) derived from Coriolus versicolor [20-22], Polysaccharopeptide (PSP) isolated from Coriolus versicolor , and schizophyllan from Schizophyllum commune [21,38]. Several plant-based antimicrobial peptides (AMPs) have been shown to have anticancer activity . Such anticancer peptides (ACPs) are very promising and have two significant advantages: (i) they can selectively bind to cancer cell membrane by electrostatic interaction between negatively charged cancer cell membranes and the cationic peptides , and (ii) in order to be effective, the conventional anticancer drugs have to enter the cancer cells; long term use of these drugs can therefore cause drug resistance . However, anticancer peptides inhibit cancer cell growth through membrane-disruption and do not enter the cancer cells. Hence, cancer cells will not develop resistance to these anticancer peptides [40,41]. Most of the conventional chemotherapy agents are either non-selective or present an insufficient selectivity. Such non-selective agents cause side effects for healthy human cells, such as mucositis, thrombocytopenia, myelossupression and hair loss [42-44]. However, anti-cancer peptides have been proved to be resourceful agents for targeted cancer therapy with higher selectivity for neoplastic cells and reduced harmful effects. As described in section 2, diabetes mellitus is a complex metabolic disorder associated with development of insulin resistance, impaired insulin signalling and β-cell dysfunction, abnormal glucose and lipid metabolism, sub-clinical inflammation and increased oxidative stress. These metabolic disorders lead to long-term pathogenic conditions including micro- and macro-vascular complications, neuropathy, retinopathy, nephropathy, and a consequent decrease in quality of life and an increase in the rate of mortality [3,23]. Therefore, natural products used for the treatment of diabetes and associated disorders must exhibit a variety of activities in addition to anti-hyperglyceamic effect. These activities and effects are summarised in figure below (Figure 1). In the literature, the possible relationships were investigated between the chemical structure of natural products and their anti-diabetic properties . The mechanisms of action and the specific structural features responsible for the action of anti-diabetic agents are highlighted in this section. Figure 1: Flow chart showing strategies to develop anti-diabetic natural compounds [3,23]. It is important to mention at this point that there are three important pathways for anti-diabetic action. Namely, α- amylase inhibition, PPAR modulation and GSK-3β inhibition [3,23,45-49]. Structural details of such inhibitors / modulators and their actions are discussed below. Action of α-amylase inhibitors: Literature reveals that polyphenols are responsible for a variety of bioactivities including anti-diabetic action [3,23]. In particular, flavonoids are extremely important organic natural products that function as anti-diabetic compounds. General structural formulae of flavonoids are given below (Figure 2). Figure 2: General structure of flavonoids (R and R’ may be hydroxyl groups or hydrogens). It is pertinent to note that the regulation of carbohydrate metabolism is one of the important property required for an effective anti-diabetic flavonoid . In humans, α-amylase (α-1,4-glucan-4-glucanohydrolase) is present in both salivary and pancreatic secretions and plays an important role in catalysing the hydrolysis of α-(1,4)-glycosidic linkages in starch [26,50-52]. Therefore, inhibition of α-amylase plays an important role in digestion of starch and glycogen, which is considered to be one of the strategies for the treatment of disorders related to carbohydrate uptake . α-amylase is composed of 496 amino acids in a single polypeptide chain and contains one chloride ion and at least one calcium ion which are essential for enzyme activity [50,51]. Structural studies reveal that the binding site of α- amylase consists of the amino acid sequence Aspartate (Asp 197) - Glutamate (Glu 233) - Aspartate (Asp 300) that can interact with hydroxyl groups in flavonoids leading to the inhibition of enzyme activity [26,52]. Flavonoids share a common structural skeleton consisting of two aromatic rings (A and B) that are linked by three carbons and form an oxygenated heterocycle (ring C) (Figure 2). Literature demonstrates that the α-amylase inhibition activity of flavonoids depends on the following structural features [26,52,53]: (i) number of hydroxyl groups on the B ring of the flavonoid skeleton. Especially, the presence of hydroxyl groups at C4’ or C5’ is important for binding with α- amylase, (ii) presence of hydroxyl groups in positions C6 or C7 of the ring A is also important for binding and (iii) highly conjugated π-system present in flavonoids contributes to better stability of the enzyme-substrate complex . These are the main structural feathers of anti-diabetic flavonoids that determine their effective binding with α-amylase. Action of PPARϒ modulators: Nuclear receptors are the most common membrane receptors that can bind with plant derived bioactive molecules of various kinds [54,55]. Peroxisome proliferator-activated receptors (PPARα and PPARϒ), a type of nuclear receptors, are dietary lipid sensors that regulate lipid and carbohydrate metabolism [54,55]. These are highly specific receptors for dietary terpenoids [54-56]. PPARϒ is the important receptor for glucose uptake and consists of 13 α-helices and a small β-sheet. This is a multi-domain protein containing a structurally conserved ligand-binding domain (LBD) which is important for glucose regulation . There is an Activation Function 2 (AF2) surface within the LBD and this surface is formed by α-helices 3-5 and 12. PPARϒ agonists are the compounds that bind in the LBD of the receptor and stabilise AF2 surface and consequently stabilise the α-helices within this surface . Such a binding activates PPARϒ receptor and produces the biological response. This leads to insulin sensitisation and anti-diabetic action. Terpenoids are classic examples of PPARϒ modulators [54-56]. Crystallographic studies have revealed that the ligand adopts a conformational change in the binding pocket of PPARϒ and forms hydrogen bonds between acidic head group and His 323 on helix 5 and Tyr 473 on the AF2 helix and stabilises the active conformation of the receptor . The structure of abietic acid (a terpenoid), which is an effective binder of PPARϒ is given in Figure 3. 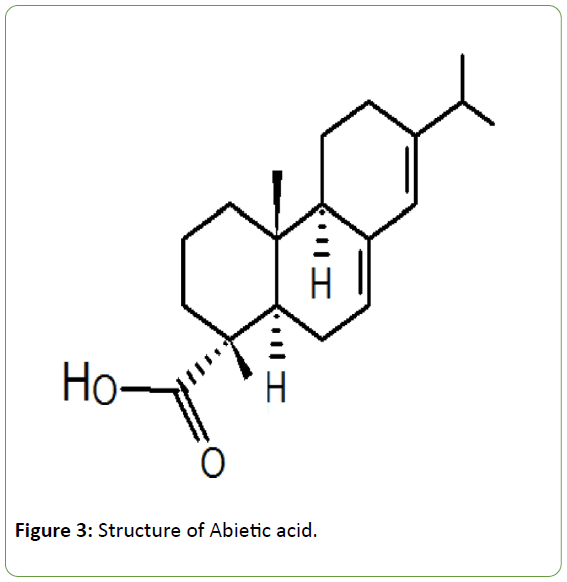 Figure 3: Structure of Abietic acid. This action of terpenoids results in insulin sensitisation and leads to anti-diabetic effect [3,23,55,56,58]. Action of PPARα modulators: PPARα is another nuclear receptor, which is predominantly expressed in the liver, muscle, and the digestive tract and is known to regulate the expression of target genes involved in lipid catabolism [23,45,55,56]. Binding of suitable ligand within the active site of PPARα leads to its activation and causes hepatic lipid metabolism. This action consequently decreases triglycerides and circulating lipid levels [23,45,55,56]. The binding site in PPARα is located in the central core of the LBD, and consists of the helical sandwich (made of helices 3, 5, 7, 11 and 12) and a four-stranded β-sheet [57,59]. There is a large pocket within the LBD of PPARα and the terpenoids bind into this poket. The ligand takes suitable conformation within the binding pocket that allows the acidic head group of the terpenoid to form H-bonds with Try 314 on helix 5 and Try 464 of the receptor . Hydrophobic end of the ligand interacts with the receptor surface and activates PPARα. Action of GSK-3β inhibitors: Another important enzyme to be considered to develop targets for type 2 diabetes is glycogen synthase kinase 3β (GSK-3β). GSK-3β is the most studied kinase that plays a key role in several biological processes including insulin action [46-49]. This enzyme also plays an important role in the regulation of glycogen synthase (GS). Over expression of GSK-3β inhibits GS that can lead to type 2 diabetes [46-49]. The structure of GSK-3β consists of a small lobe of β-sheets at the N-terminal and a large lobe formed by α-helices at the C-terminal [47-49]. The binding site of GSK-3β consists of Arg 96, Arg 180, Lys 205 and other residues to form a small pocket [47-49]. GSK-3β inhibitors bind via the hydrophobic interactions and several H-bonds within the binding pocket. The carbonyl functional groups in the binding pocket act as H-bond acceptors and the side chains of the amino acid residues in the binding pocket act as H-bond donors [47-49]. Therefore, the structural features of GSK-3β inhibitors include: (i) low molecular weight compounds to fit into the small binding pocket of this enzyme; (ii) hydrophobic heterocyclic molecules with flat structure are suitable for binding, and (iii) H-bonding functional groups such as carboxyl and hydroxyl groups will enhance the binding [47-49]. For example, fukugetin is an efficient binder of GSK-3β that recognises its binding pocket with several non-covalent interactions [47-49]. These interactions include hydrogen bonds with residues Leu 88, Asm 95, Arg 96 and Glu 97. In addition, there is a possibility of π-π interaction between the ligand and the amino acid residues in the active site that facilitate binding and improve inhibitory activity [47,49]. It is worth noting at this point that the enormous scientific knowledge on structure-antidiabetic function reviewed above is not commensurate with the real utility of natural product based therapeutics to treat type 2 DM. There are very few examples of natural compounds that have undergone clinical trials and / or reached the stage of clinical application. For example, pycnogenol is the water extract of French maritime pine bark and consists mainly of Catechin and procyanidines. This patented product displays antidiabetic activity by inhibiting α-glucosidase and α-amylase . Clinical studies demonstrated that pycnogenol in combination with oral antidiabetic therapeutics led to the reduction of blood glucose levels and improved endothelial function in type-2 DM patients . Other examples of antidiabetic compounds include natural polyphenolic compounds such as honokiol, amorfruitin 1, amorfrutin B and amorphastilbol, that display significant antidiabetic effect by activating PPARϒ receptor [60-62]. Resveratrol is another natural polyphenolic compound that has been demonstrated to improve insulin sensitivity in type 2 DM patients . Resveratrol molecule can also be used as an improtant drug lead to develop novel therapeutics with improved activity . As described in section 2, organic natural products from medicinal plants display a variety of pharmaceutical activities that include antioxidant property, anti-tumor activity, immuno-regulation function, protein kinase inhibition and anti-diabetic activity and many more [13,31,64-76]. Literature demonstrates that the differences in bioactivities of these compounds originate from the differences in their structures [68-76]. Certain important structural elements and functional groups that are present in these natural compounds play significant role in enhancing their bioactivities including antitumor activity [74-77]. This section focuses on structure-function relationships of anticancer compounds such as flavonoids, terpenoids, alkaloids, sponins, peptides and polysaccharides isolated from medicinal plants. Action of anticancer flavonoids: Flavonoids are extremely important organic natural products that display a range of biological activities. General structural formulae of flavonoids are given in Figure 2. Cancer is a complex and dynamic disease and its treatment requires chemo-therapeutics that possesses several biological activities . To be effective for cancer treatment, a chemo-therapeutic agent must display a variety of anticancer effects summarised in figure below (Figure 4). Figure 4: Various anticancer effects of flavonoids [31,65]. Flavonoids form an important class of polyphenols that are ubiquitous in medicinal plants and are vital constituents of human diet [31,75,79]. In the literature, the possible relationships were investigated between the chemical structure of flavonoids and their anticancer properties . The mechanisms of action and the specific structural features of flavonoids responsible for anticancer activity are highlighted in the following sub-sections. Flavonoids inhibit several protein-kinases (PKs) causing the modulation of cell signal pathways. This property of flavonoids has been recognised as an extremely important aspect in cancer treatment as this function prevents uncontrolled cell division [31,83-85]. Flavonoids also inhibit topoisomerases that play a key role in maintaining DNA structural topology during replication, transcription and recombination. This property is extremely useful to design chemotherapeutic agents, because topoisomerase inhibitors prevent the formation of enzyme- DNA complex and hence inhibit further steps of the catalytic cycle . Certain flavonoid based inhibitors of topoisomerase II (topo II) prevent metastasis and angiogenesis by regulating the expression of relevant genes [31,86-88]. Flavonoids have also been shown to act as antiangiogenic agents. This property is essential for an antitumor agent because “rapid tumor growth and tumor metastasis are promoted by uncontrolled angiogenesis”. Flavonoids (e.g. genistein) display antiangiogenic effects by regulating the expression of vascular endothelial growth factor (VEGF), matrix metalloproteinases (MMPs) and epidermal growth factor receptors (EGFRs) through the inhibition of certain signalling pathways [31,89,90]. Flavonoids suppress the formation of reactive oxygen species (ROS). This protective mechanism of flavonoids prevents oxidative stress in biological systems and reduces the risk of oxidative damage to biopolymers such as DNA, and hence prevents the cancer formation and growth [31,65,66]. Therefore, flavonoids act as chemo-preventative as well as chemotherapeutic agents. Flavonoids also act as modulators of multidrug resistance (MDR) which is a major problem in cancer chemotherapy. Mechanism of MDR action is thought to be due to the inhibition of overexpressing multi-drug resistance gene . As discussed before, inhibition of protein kinases is one of the important activities necessary for effective anticancer therapy. Structure-activity studies of flavonoids have revealed that the following structural features are important for the inhibition of protein kinases [31,83-85]. Structure of ring-C: Double bond must exist between C-2 and C-3 (Figure 2) carbons. In addition, some protein kinases (e.g. protein kinase C (PKC) and Cyclin-dependent kinases (CDK)) need C-4 oxo group (C=O on C4) as shown in Figure 2 which increases the conjugation. For example, Luteolin exhibits significant inhibition activity of PKC [31,83,85]. Hydroxyl groups: Presence of hydroxyl groups on C-5 and C-7 carbons of ring-A enhances the inhibitory activity. In addition, a hydroxyl group on ring-C (C-3 carbon) improves the PTK inhibition activity . Certain protein kinases (e.g. PKC and CDKs) require hydroxyl groups on ring-B (on C-3' and C-4' carbons). For example, quercetin with hydroxyl groups on all the three rings is a good inhibitor [31,91]. Antiangiogenic activity is another important property required for the antitumor capacity of flavonoids (Fig 4). The Structure-activity studies of flavonoids demonstrated that the following structural features are important for the inhibition of angiogenesis [31,92]. As discussed before, the antioxidant activities of flavonoids is necessary for prevention/treatment of cancer [31,79]. The main structural features of flavonoids for their antioxidant activities are listed below [31,66]. –OH groups located in ortho position at ring-B are crucial for antioxidant activity (e.g. quercetin). C-2 and C-3 double bond conjugated with C-4 oxo group (C=O) in ring-C is also necessary for antioxidant activity. Multidrug resistance (MDR) possess a major problem in chemotherapy. Flavonoids exhibit significant multidrug resistance modulatory activity . Structure-activity studies involving multidrug resistance modulation showed that -OH groups in positions C-5 and C-6' of flavonoid rings A and B respectively are important for MDR modulation activity. In addition, the C-2 and C-3 double bond conjugated with carbonyl group in ring-C are required for this activity. Polysaccharides have been shown to trigger immune response by interacting with several immune receptors . This leads to the activation of innate as well as adaptive immune response and produces nature killer (NK) cells, lymphokine-activated killer (LAK) cells, tumor antigen-specific cytotoxic T lymphocytes (CTLs) [76,94]. This property of polysaccharides is responsible for their indirect anticancer action. Polysacchrides can directly inhibit cancer cell growth by reducing the expression of cell cycle related proteins such as cyclin D1, cyclin E and Bcl-2 and up-regulation of p12 . β- (1→3) glucans (e.g. polysaccharide K (PSK)) have been shown to directly inhibit cancer cell growth by antiangiogensis activity. This mechanism involves the inhibition of basic fibroblast growth factor (bFGF)-induced angiogenesis. It is speculated that this action is the result of direct binding of PSK with bFGF . PSK is also known to inhibit metastasis by suppression of intravasation through the inhibition of tumor invasion . As discussion above, immunomodulatory activity is one of the important activities required for an effective anticancer polysaccharide. Literature demonstrates that the following structural features of polysaccharides are important for the modulation of immune system [13,93]. Polysaccharide conformation, such as glycosidic linkage and helical structure, is the most important factor that influences their immuno-stimulatory activates [13,76]. Literature indicates that Glucan with (1→3)-β-linkages and (1→4)-α-linkage are important structural feature for immunostimulatory activities . In addition, degree of branching (DB) is also an important factor that influences the anticancer and immuno-stimulatory activities of polysaccharides . Triple helical conformation of (1→3)-β-glucans has been shown to be important for immuno-stimulatory and antitumor activity [71,76]. Action of anticancer peptides: Bioactive natural peptides can be found in many types of plants, fungi and microorganisms. These peptides can have linear, cyclic or open-ended cyclic structures with one or more disulphide bridges [41,96-98]. In general, anticancer peptides (ACPs) mainly display two modes of cytotoxic action, namely, membranolytic and non-membranolytic [41,97]. Membranolytic effect of cationic ACPs arises mainly due to the presence of anionic molecules on cell surface conferring a net negative charge on cancer cell membrane [41,96,97]. Non-membranolytic effects of ACPs involve inhibition of angiogenesis, modulation of antitumor immune response and inhibition of metastasis [96,97,99,100]. Cationic ACPs that act by membranotytic effect are discussed in this section. Most cancer cell membranes have a net negative surface charge. These characteristics of cancer cells have been recognised as an extremely important factor for selectivity of cationic anticancer peptides (ACPs) towards neoplastic cells [41,96,97]. In addition, the process of glycosylation of transmembrane glycoproteins changes in cancer cell. This change ultimately leads to the increased net negative charge on the cancer cell membrane improving binding ability of cationic ACPs leading to apoptosis or necrosis [41,97]. The altered glycosylation of cancer cell membrane proteins is also believed to be responsible for increased permeability of cell membrane which leads to increased anticancer activity . Cancer cells have a greater cell surface area than normal cells which will allow cancer cells to bind with an increased number of cationic anticancer peptides enhancing their potency [41,97]. Certain anticancer peptides inhibit DNA polymerase β and hence inhibit DNA synthesis leading to the suppression of human cancer cell proliferation [97,101]. Once again, it should be noted that the scientific knowledge on the relationship of molecular structure and anticancer activity has not been fully exploited to develop natural product based therapeutics to effectively treat cancer. There are only a few examples of natural products that are used to treat cancer in combination with known chemotherapeutic agents. For example, it is demonstrated that the mushroom polysaccharides PSK and PSP are of great value when used in combination with existing chemotherapeutic agents to treat cancer [19-22]. Another class of natural compounds that have potential to treat cancer are alkaloids. For example, vinca alkaloids (vinblastine, vinorelbine, vincristine and vindesine) can induce cancer cell apoptosis by inhibition of cell mitosis [102,103]. However, vinca alkaloids can also reduce the number of white blood cells and lead to various side effects which include bone marrow depression, nausea, headaches, dizziness . These risks have limited the progression of vinca alkaloids into clinical use. This problem can partly be solved by developing suitable conjugates to deliver the anticancer agents to the target sites . There are many challenges for the effective use of anticancer therapeutics. In general, systemic toxicity and lack of tumor selectivity of the anticancer drugs are the main disadvantages that cause undesirable side effects specifically in the case of low molecular weight therapeutics . Covalent conjugation of macromolecules to these low molecular weight anticancer drugs has been used to address this issue [104,105]. Amongst them, polysaccharide-based drug conjugates have gained enormous interest in this direction mainly owing to the fact that polysaccharides are abundant in nature, cost effective and easy to make chemical modifications to form drug conjugates . Some of the benefits of conjugated prodrugs are improved solubility, tumor selectivity (by enhanced permeation and retention) and improved half-life . Successful examples of polysaccharides used to make anticancer drug conjugates include hyaluronic acid, dextran, cyclodextrin and chitosan [104,106]. Owing to many desirable functional features and preclinical/clinical success, polysaccharide drug conjugates form promising novel candidates for effective cancer therapy. Numerous literatures demonstrates that glucose metabolic disorder leads to increase risk of formation of several types of cancers, such as liver, pancreas, stomach, and breast [107-111]. It has been found that the causal mechanisms involved in the link between diabetes and cancer formation are not fully clear . Some of the possible mechanisms behind the link between diabetes and cancer formation are outlined below. Hyperglycaemia, insulin resistance, oxidative stress and the associated inflammation have been proposed to be some of the causal pathways for cancer formation . Insulin resistance has been shown to be associated with higher risk of cancer formation in diabetic patients , and hence it is assumed to be the possible pathway for directly stimulating of cancer formation . Hyperglycaemia and associated oxidative damage are are reported to cause cancer cell proliferation as well as metastasis in diabetic patients. Clinical study demonstrates that diabetes cause over-production of reactive oxygen species that can lead to DNA damage and development of cancer . In addition, the oxidative stress along with poor metabolic control causes pro-inflammatory conditions and can increase the risk of cancer development [107,113]. There has been significant progress in developing therapeutics for metabolic disorders and cancer from medicinal plants. The mechanisms of action and the specific structural features responsible for the action of various types of anti-diabetic and anticancer agents derived from plant sources are highlighted in this review. Three important pathways for anti-diabetic action are discussed. They include α-amylase inhibition, PPAR modulation and GSK-3β inhibition. Different pathways and mechanisms by which anticancer activities of flavonoids, peptides and polysaccharides occur have also been discussed in this review. It is concluded that the development of natural product based formulations that simultaneously address various mechanisms of action are likely to be more effective to manage these diseases. It is clear from the literature reviewed and discussed in this article that more research is required to transform the existing knowledge into practical use. Authors would like to acknowledge the support from School of Science and Health and National Institute of Complementary Medicine (NICM), Western Sydney University. Yun MW, Abdullah NL, Idrus R, Keikhosrokiani P (2017) Lifestyle disease prevention: Health literacy, health attitude and mHealth. Research and Innovation in Information Systems (ICRIIS), International Conference on: IEEE 1-6. Arulselvan P, Ghofar HAA, Karthivashan G, Halim MFA, Ghafar MSA, et al. (2014) Antidiabetic therapeutics from natural source: A systematic review. Biomedicine & Preventive Nutrition 4: 607-617. Hung HY, Qian K, Morris-Natschke SL, Hsu CS, Lee KH (2012) Recent discovery of plant-derived anti-diabetic natural products. Nat Pro Rep 29: 580-606. Mentreddy SR (2007) Medicinal plant species with potential antidiabetic properties. J Sci Food Agric 87: 743-750. Leon BM, Maddox TM (2015) Diabetes and cardiovascular disease: Epidemiology, biological mechanisms, treatment recommendations and future research. World J Diabetes 6: 1246. Mendis S (2017) Global progress in prevention of cardiovascular disease. Cardiovasc Diagn Ther 7: S32. Morgan TO, Anderson AI, MacInnis RJ (2001) ACE inhibitors, beta-blockers, calcium blockers, and diuretics for the control of systolic hypertension. Am J Hypertens 14: 241-247. Pahan K (2006) Lipid-lowering drugs. Cell Mol Life Sci CMLS 63(10):1165-1178. Jones MR, Nwose OM (2013) Role of colesevelam in combination lipid-lowering therapy. AMJ Cardiovasc Drug 13: 315-323. Toyoshima H, Takahashi K, Akera T (1997) The impact of side effects on hypertension management: a Japanese survey. Clinical therapeutics. 19: 1458-1469. Saljoughian S, Roohinejad S, Bekhit AEDA, Greiner R, Omidizadeh A, et al. (2017) The effects of food essential oils on cardiovascular diseases: A review. Crit. Rev. Food Sci. Nutr 10: 1-18. Sgro C, Escousse A (1991) Side effects of fibrates (except liver and muscle) Therapie 46: 351-354. Zhang L, Koyyalamudi SR, Reddy N (2014) Isolation, characterization, and biological activities of polysaccharides from medicinal plants and mushrooms. In: Atta-ur-Rahman,FRS (ed), Studies in Nature Products Chemistry, (1st edn) UK, pp. 117-147. Torre LA, Bray F, Siegel RL, Ferlay J, Lortet-Tieulent J, et al. (2015) Global cancer statistics, 2012. CA: a cancer journal for clinicians 65: 87-108. Cheung-Ong K, Giaever G, Nislow C (2013) DNA-damaging agents in cancer chemotherapy: serendipity and chemical biology. Chemistry & biology. 20: 648-659. Herr I, Debatin KM (2001) Cellular stress response and apoptosis in cancer therapy. Blood. 98: 2603-2614. Bagnyukova TV, Serebriiskii IG, Zhou Y, Hopper-Borge EA, Golemis EA, et al. (2010) Chemotherapy and signaling: How can targeted therapies supercharge cytotoxic agents? Cancer Biol Ther 10: 839-853. Pérez-Herrero E, Fernández-Medarde A (2015) Advanced targeted therapies in cancer: drug nanocarriers, the future of chemotherapy. Eur J Pharm Biopharm 93: 52-79. Cheng KF, Leung PC (2008) General review of polysaccharopeptides (PSP) from C. versicolor: Pharmacological and clinical studies. Cancer Ther 6: 117-130. Friedman M, (2016) Mushroom Polysaccharides: Chemistry and Antiobesity, Antidiabetes, Anticancer, and Antibiotic Properties in Cells, Rodents, and Humans. Foods 5: 80. Sugiyama Y (2016) Polysaccharides. In Yamaguchi, Y (Ed), Immunotherapy of Cancer, Springer: pp 37-50. Torisu M, Hayashi Y, Ishimitsu T, Fujimura T, Iwasaki K, et al. (1990) Significant prolongation of disease-free period gained by oral polysaccharide K (PSK) administration after curative surgical operation of colorectal cancer. Cancer Immunol Immunother. 31: 261-268. Bahadoran Z, Mirmiran P, Azizi F (2013) Dietary polyphenols as potential nutraceuticals in management of diabetes: a review. J Diabetes Metab Disord 12: 43. Hwang JT, Kwon DY, Yoon SH (2009) AMP-activated protein kinase: a potential target for the diseases prevention by natural occurring polyphenols. New biotechnology 26: 17-22. Arulselvan P, Ghofar HAA, Karthivashan G, Halim MFA, Ghafar MSA, et al. (2014) Antidiabetic therapeutics from natural source: A systematic review. Biomedicine & Preventive Nutrition. 4: 607-617.
de Sales PM, Souza PM, Simeoni LA, Magalhães PO Silveira D (2012) α-Amylase inhibitors: a review of raw material and isolated compounds from plant source. J Pharm Pharm Sci 15: 141-183. Chen J, Li W, Wu J, Ren B, Zhang H (2008) Hypoglycemic effects of a sesquiterpene glycoside isolated from leaves of loquat (Eriobotrya japonica (Thunb.) Lindl.) Phytomedicine 15: 98-102. Shah U, Shah R, Acharya S, Acharya N (2013) Novel anticancer agents from plant sources. Chin J Nat Med 11: 16-23. Zhang L, Koyyalamudi SR, Jeong SC, Reddy N, Smith PT, et al. (2012) Antioxidant and immunomodulatory activities of polysaccharides from the roots of Sanguisorba officinalis. Int. J. Biol. Macromolec. 51: 1057-1062. Talhouk, R, Karam, C, Fostok, S, El-Jouni W, Barbour E (2007) Anti-inflammatory bioactivities in plant extracts. Journal of Medicinal Food 10: 1-10. Ravishankar D, Rajora AK, Greco F, Osborn HM (2013) Flavonoids as prospective compounds for anti-cancer therapy. Int J Biochem Cell Biol 45: 2821-2831. Sghaier MB, Skandrani I, Nasr N, Franca MGD, Chekir-Ghedira L, et al. (2011) Flavonoids and sesquiterpenes from Tecurium ramosissimum promote antiproliferation of human cancer cells and enhance antioxidant activity: a structure–activity relationship study. Environ Toxicol Pharmacol 32: 336-348. Hämäläinen M, Nieminen R, Vuorela P, Heinonen M, Moilanen E (2007) Anti-inflammatory effects of flavonoids: genistein, kaempferol, quercetin, and daidzein inhibit STAT-1 and NF-κB activations, whereas flavone, isorhamnetin, naringenin, and pelargonidin inhibit only NF-κB activation along with their inhibitory effect on iNOS expression and NO production in activated macrophages. Mediators Inflamm 2007: 1-10. Fantini M, Benvenuto M, Masuelli L, Frajese GV, Tresoldi I, et al. (2015) In vitro and in vivo antitumoral effects of combinations of polyphenols, or polyphenols and anticancer drugs: perspectives on cancer treatment. Int J Mol Sci 16: 9236-9282. Rusak G, Gutzeit HO, Müller JL (2005) Structurally related flavonoids with antioxidative properties differentially affect cell cycle progression and apoptosis of human acute leukemia cells. Nutrition Research 25:143-155. Vetvicka V, Vetvickova J (2012) Combination of glucan, resveratrol and vitamin C demonstrates strong anti-tumor potential. Anticancer Res. 32: 81-87. Schepetkin IA, Quinn MT (2006) Botanical polysaccharides: macrophage immunomodulation and therapeutic potential. International immunopharmacology 6: 317-333. Daba A, Ezeronye O (2003) Anti-cancer effect of polysaccharides isolated from higher basidiomycetes mushrooms. Afr J Biotechnol 2: 672-678. Ina K, Kataoka T, Ando T (2013) The use of lentinan for treating gastric cancer. Anticancer Agents Med Chem. 13: 681-688. Guzmán-Rodríguez JJ, Ochoa-Zarzosa A, López-Gómez R, López-Meza JE (2015) Plant antimicrobial peptides as potential anticancer agents. Biomed Res Int 2015: 1-11. Hoskin DW, Ramamoorthy A (2008) Studies on anticancer activities of antimicrobial peptides. Biochimica et Biophysica Acta (BBA)-Biomembranes. 1778: 357-375. Kalyanaraman B, Joseph J, Kalivendi S, Wang S, Konorev E, et al. (2002) Doxorubicin-induced apoptosis: implications in cardiotoxicity. Oxygen/Nitrogen Radicals: Cell Injury and Disease: Springer p. 119-124. Riedl S, Zweytick D, Lohner K (2011) Membrane-active host defense peptides–challenges and perspectives for the development of novel anticancer drugs. Chem Phys Lipids 164: 766-781. Al-Benna S, Shai Y, Jacobsen F, Steinstraesser L (2011) Oncolytic activities of host defense peptides. Int. J. Mol. Sci. 12: 8027-8051.
van Raalte DH, Li M, Pritchard PH, Wasan KM (2004) Peroxisome proliferator-activated receptor (PPAR)-α: a pharmacological target with a promising future. Pharmaceutical research. 21: 1531-1538. Cantizani J, Ortiz J, Ravipati AS, Rodriguez L, Cautain B, et al. (2014) Screening for natural inhibitors in Chinese medicinal plants against Glycogen synthase kinase 3β (GSK-3β) Pharmacologia 5:205-214. Meijer L, Flajolet M, Greengard P (2004) Pharmacological inhibitors of glycogen synthase kinase 3. Trends Pharmacol Sci 25: 471-480. Gokhale KM, Tilak BP (2013) Role of glycogen synthase kinase (GSK-3) in type-2 diabetes and GSK-3 inhibitors as potential anti-diabetics. Int J Pharm Sci Res 3: 196-199. Li Y, Xu J, Chen Y, Mei Z, Xiao Y (2015) Screening of inhibitors of glycogen synthase kinase-3β from traditional Chinese medicines using enzyme-immobilized magnetic beads combined with high-performance liquid chromatography. J Chromatogr A 1425: 8-16. Sundarram A, Murthy TPK (2014) α-amylase production and applications: a review. J Appl Environ Microbiol 2: 166-175. Larson SB, Greenwood A, Cascio D, Day J, McPherson A (1994) Refined molecular structure of pig pancreatic α-amylase at 2.1 Å resolution. J Mol Biol 235: 1560-1584. Lo Piparo E, Scheib H, Frei N, Williamson G, Grigorov M, et al. (2008) Flavonoids for controlling starch digestion: structural requirements for inhibiting human α-amylase. J Med Chem 51: 3555-3561. Brayer GD, Sidhu G, Maurus R, Rydberg EH, Braun C, et al. (2000) Subsite mapping of the human pancreatic α-amylase active site through structural, kinetic, and mutagenesis techniques. Biochemistry 39: 4778-4791. Frkic RL, He Y, Rodriguez BB, Chang MR, Kuruvilla D, et al. (2017) Structure–Activity Relationship of 2, 4-Dichloro-N-(3, 5-dichloro-4-(quinolin-3-yloxy) phenyl) benzenesulfonamide (INT131) Analogs for PPARγ-Targeted Antidiabetics. J Med Chem 60: 4584-4593. Goto T, Takahashi N, Hirai S, Kawada T (2010) Various terpenoids derived from herbal and dietary plants function as PPAR modulators and regulate carbohydrate and lipid metabolism. PPAR Research 2010: 1-9. Reyes BA, Dufourt EC, Ross J, Warner MJ, Tanquilut NC et al. (2017) Selected Phyto and Marine Bioactive Compounds: Alternatives for the Treatment of Type 2 Diabetes. In: Atta-ur-Rahman, FRS (ed), Studies in Nature Products Chemistry, UK, pp. 111-143. Xu HE, Lambert MH, Montana VG, Plunket KD, Moore LB, et al. (2001) Structural determinants of ligand binding selectivity between the peroxisome proliferator-activated receptors. Proc. Natl. Acad. Sci. 98: 13919-13924. Hanhineva K, Törrönen R, Bondia-Pons I, Pekkinen J, Kolehmainen M et al. (2010) Impact of dietary polyphenols on carbohydrate metabolism. Int J Mol Sci 11: 1365-1402. Cronet P (2001) Structure of the PPARalpha and-gamma ligand binding domain in complex with AZ 242; ligand selectivity. Structure 9: 699-706. Ríos JL. Francini F, Schinella GR (2015) Natural products for the treatment of type 2 diabetes mellitus. Planta Medica. 81: 975-994. Wang L, Waltenberger B, Pferschy-Wenzig EM, Blunder M, Liu X, et al. (2014) Natural product agonists of peroxisome proliferator-activated receptor gamma (PPARγ): a review. Biochemical Pharmacology 92: 73-89. Katz SR, Newman RA, Lansky EP (2007) Punica granatum: heuristic treatment for diabetes mellitus. Journal of medicinal food 10: 213-217. Öztürk E, Arslan AKK, Yerer MB, Bishayee A (2017) Resveratrol and diabetes: A critical review of clinical studies. Biomedicine & Pharmacotherapy 95: 230-234. Jeong SC, Koyyalamudi SR, Jeong YT, Song CH, Pang G (2012) Macrophage immunomodulating and antitumor activities of polysaccharides isolated from Agaricusbisporus white button mushrooms. J Med Food 15: 58-65. Sghaier MB, Skandrani I, Nasr N, Franca MGD, Chekir-Ghedira L, et al. (2011) Flavonoids and sesquiterpenes from Tecuriumramosissimum promote antiproliferation of human cancer cells and enhance antioxidant activity: a structure–activity relationship study. Environ Toxicol Pharmacol 32: 336-348. Scotti L, Jaime Bezerra Mendonca Junior F, Rodrigo Magalhaes Moreira D, Sobral da Silva M, Pitta IR, et al. (2012) SAR, QSAR and docking of anticancer flavonoids and variants: a review. Curr Top Med Chem 12: 2785-2809. Zhang L, Koyyalamudi SR, Jeong SC, Reddy N, Bailey T, et al. (2013) Immunomodulatory activities of polysaccharides isolated from Taxillus chinensis and Uncaria rhyncophylla. Carbohydr Polym 98: 1458-1465. Nie SP, Xie MY (2011) A review on the isolation and structure of tea polysaccharides and their bioactivities. Food Hydrocolloids 25: 144-149. Nijveldt RJ, Van Nood E, Van Hoorn DE, Boelens PG, Van Norren K, et al. (2001) Flavonoids: a review of probable mechanisms of action and potential applications. Am J Clin Nutr 74: 418-425. Ghantous A, Gali-Muhtasib H, Vuorela H, Saliba NA, Darwiche N (2010) What made sesquiterpene lactones reach cancer clinical trials? Drug Discov Today 15: 668-678. Zhang M, Cui S, Cheung P, Wang Q (2007) Antitumor polysaccharides from mushrooms: a review on their isolation process, structural characteristics and antitumor activity. Trends Food Sci Technol 18: 4-19. Jin M, Zhao K, Huang Q, Xu C, Shang P (2012) Isolation, structure and bioactivities of the polysaccharides from Angelica sinensis (Oliv.) Diels: A review. Carbohydrate polymers 89: 713-722. Jiang MH, Zhu L, Jiang JG (2010) Immunoregulatory actions of polysaccharides from Chinese herbal medicine. ‎Expert Opin. Ther. Targets 14: 1367-1402. Fiuza S, Gomes C, Teixeira L, Da Cruz MG, Cordeiro M, et al. (2004) Phenolic acid derivatives with potential anticancer properties––a structure–activity relationship study. Part 1: Methyl, propyl and octyl esters of caffeic and gallic acids. Bioorganic & Medicinal Chemistry 12: 3581-3589. Cai YZ, Sun M, Xing J, Luo Q, Corke H (2006) Structure–radical scavenging activity relationships of phenolic compounds from traditional Chinese medicinal plants. Life sciences. 78: 2872-2888. Zhang L, Li CG, Liang H, Reddy N (2017) Bioactive Mushroom Polysaccharides: Immunoceuticals to Anticancer Agents. J Nutraceuticals Food Sci 2: 6. Santos SR, Melo MA, Cardoso AV, Santos RL, de Sousa, et al. (2011) Structure–activity relationships of larvicidal monoterpenes and derivatives against Aedes aegypti Linn Chemosphere 84: 150-153. Cho WC (2010) Supportive cancer care with Chinese medicine. Springer, pp1-8. Zhang L, Ravipati AS, Koyyalamudi SR, Jeong SC, Reddy N, et al. (2011) Antioxidant and anti-inflammatory activities of selected medicinal plants containing phenolic and flavonoid compounds. J Agric Food Chem 59: 12361-12367. Plochmann K, Korte G, Koutsilieri E, Richling E, Riederer P, et al. (2007) Structure–activity relationships of flavonoid-induced cytotoxicity on human leukemia cells. Arch Biochem Biophys 460: 1-9. López-Lázaro M, Willmore E, Austin CA (2010) The dietary flavonoids myricetin and fisetin act as dual inhibitors of DNA topoisomerases I and II in cells. Mutat Res Genet Toxicol Environ Mutagen 696: 41-47. Hashemi M, Behrangi N, Borna H, Entezari M (2012) Protein tyrosine kinase (PTK) as a novel target for some natural anti-cancer molecules extracted from plants. J Med Plants Res 6: 4375-4378. Byun S, Lee KW, Jung SK, Lee EJ, Hwang MK, et al. (2010) Luteolin inhibits protein kinase C (epsilon) and c-Src activities and UVB-induced skin cancer. Cancer research 70: 2415-2423. Wang LM, Ren DM (2010) Flavopiridol, the first cyclin-dependent kinase inhibitor: recent advances in combination chemotherapy. Mini-Rev Med Chem 10: 1058-1070. Gyemant N, Tanaka M, Antus S, Hohmann J, Csuka O, et al. (2005) In vitro search for synergy between flavonoids and epirubicin on multidrug-resistant cancer cells. In Vivo 19: 367-374. Baviskar AT, Madaan C, Preet R, Mohapatra P, Jain V, et al. (2011) N-fused imidazoles as novel anticancer agents that inhibit catalytic activity of topoisomerase IIα and induce apoptosis in G1/S phase. J Med Chem 54(14):5013-5030. Chowdhury AR, Sharma S, Mandal S, Goswami A, Mukhopadhyay S, et al. (2002) Luteolin, an emerging anti-cancer flavonoid, poisons eukaryotic DNA topoisomerase I. Biochemical Journal. 366: 653-661. Cantero G, Campanella C, Mateos S, Cortes, F (2006) Topoisomerase II inhibition and high yield of endoreduplication induced by the flavonoids luteolin and quercetin. Mutagenesis. 21: 321-325. Farina HG, Pomies M, Alonso DF, Gomez DE (2006) Antitumor and antiangiogenic activity of soy isoflavone genistein in mouse models of melanoma and breast cancer. Oncology Reports 16: 885-891. Guo Y, Wang S, Hoot DR, Clinton SK (2007) Suppression of VEGF-mediated autocrine and paracrine interactions between prostate cancer cells and vascular endothelial cells by soy isoflavones. J Nutr Biochem 18: 408-417. Casagrande F, Darbon JM (2001) Effects of structurally related flavonoids on cell cycle progression of human melanoma cells: regulation of cyclin-dependent kinases CDK2 and CDK1. Biochem Pharmacol 61: 1205-1215. Pratheeshkumar P, Budhraja A, Son YO, Wang X, Zhang Z, et al. (2012) Quercetin inhibits angiogenesis mediated human prostate tumor growth by targeting VEGFR-2 regulated AKT/mTOR/P70S6K signaling pathways. PloS one 7: e47516. Ren L, Perera C, Hemar Y (2012) Antitumor activity of mushroom polysaccharides: a review. Food & Function 3: 1118-1130. Maehara Y, Tsujitani S, Saeki H, Oki E, Yoshinaga K, et al. (2012) Biological mechanism and clinical effect of protein-bound polysaccharide K (KRESTIN®): review of development and future perspectives. Surgery today. 42: 8-28. Chan GCF, Chan WK, Sze DMY (2009) The effects of β-glucan on human immune and cancer cells. J Hematol Thromb 2: 25. Guzmán-Rodríguez JJ, Ochoa-Zarzosa A, López-Gómez R, López-Meza JE (2015) Plant antimicrobial peptides as potential anticancer agents. BioMed Res Int 2015: 1. Daffre S, Bulet P, Spisni A, Ehret-Sabatier L, Rodrigues EG et al. (2008) Bioactive natural peptides. In: Atta-ur-Rahman,FRS (ed), Studies in Nature Products Chemistry, UK, pp. 597-691. Wang YS, Li D, Shi HS, Wen YJ, Yang L, et al. (2009) Intratumoral expression of mature human neutrophil peptide-1 mediates antitumor immunity in mice. Clin Cancer Res 15: 6901-6911. Koskimaki JE, Karagiannis ED, Rosca EV, Vesuna F, Winnard PT, et al. (2009) Peptides derived from type IV collagen, CXC chemokines, and thrombospondin-1 domain-containing proteins inhibit neovascularization and suppress tumor growth in MDA-MB-231 breast cancer xenografts. Neoplasia 11: 1285-1291. Kuriyama I, Miyazaki A, Tsuda Y, Yoshida H, Mizushina Y (2013) Inhibitory effect of novel somatostatin peptide analogues on human cancer cell growth based on the selective inhibition of DNA polymerase β. Bioorganic Med Chem 21: 403-411. Lee CT, Huang YW, Yang CH, Huang KS (2015) Drug delivery systems and combination therapy by using vinca alkaloids. Curr Top Med Chem 15: 1491-1500. Dumontet C, Jordan MA (2010) Microtubule-binding agents: a dynamic field of cancer therapeutics. Nature reviews Drug discovery 9: 790-803. Al-Shamkhani A, Duncan R (1995) Synthesis, controlled release properties and antitumour activity of alginate-cis-aconityl-daunomycin conjugates. International Journal of Pharmaceutics 122: 107-119. Shikata K, Ninomiya T, Kiyohara Y (2013) Diabetes mellitus and cancer risk: review of the epidemiological evidence. Cancer science 104: 9-14. Wang C, Wang X, Gong G, Ben Q, Qiu W, et al. (2012) Increased risk of hepatocellular carcinoma in patients with diabetes mellitus: A systematic review and meta-analysis of cohort studies. Int J Cancer 130: 1639-1648. Ben Q, Xu M, Ning X, Liu J, Hong S, et al. (2011) Diabetes mellitus and risk of pancreatic cancer: a meta-analysis of cohort studies. Eur J Cancer 47: 1928-1937. Ge Z, Ben Q, Qian J, Wang Y, Li Y (2011) Diabetes mellitus and risk of gastric cancer: a systematic review and meta-analysis of observational studies. Eur J Gastroenterol Hepatol 23: 1127-1135. Jiang Y, Ben Q, Shen H, Lu W, Zhang Y, et al. (2011) Diabetes mellitus and incidence and mortality of colorectal cancer: a systematic review and meta-analysis of cohort studies. Eur J Epidemiol 26: 863-876. Giovannucci E, Harlan DM, Archer MC, Bergenstal RM, Gapstur SM, et al. (2010) Diabetes and cancer: a consensus report. CA: a cancer journal for clinicians 60: 207-221. Vona-Davis L, Howard-McNatt M, Rose D (2007) Adiposity, type 2 diabetes and the metabolic syndrome in breast cancer. Obesity Reviews 8: 395-408.